Internally raised BF squonk 510 pin is included. The stepped airflow design provides precise control while maintaining an ultra smooth and whistle free vaping experience. Perfect post placement allows for easy eliquid access whether you like to drip through the top, remove your cap to paint your wicks, or squonk. Conical shaped top cap provides smooth and uninterrupted airflow. True centered single coil placement with dual airflow provides airflow balance and incredible flavor. Drop in single, dual, triple, or quad coils with ease. This RDA truly removes space limitations and allows you to build exactly the way you want. DigiFlavor and The Vapor Chronicles introduce their Drop RDA, a 24mm, four post rebuildable atomizer with a gold plated built deck and stepped airflow design.Each of the four posts house a single 3.5mm terminal, which allow for easy coil placement and maximum build space with open access to trim excess. Airflow enters the drop through a “T” shaped airslot fitted with 10 air holes per side and can be fully closed. 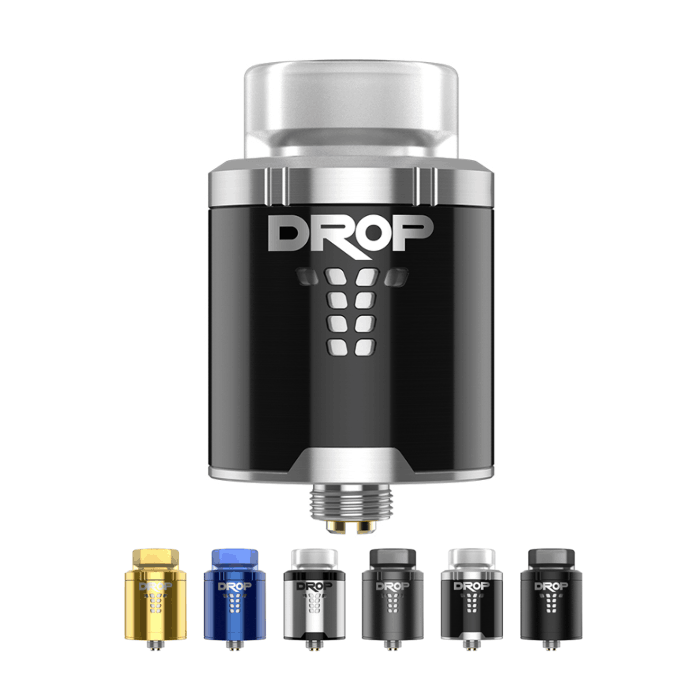 The Drop RDA comes with a pair of 810-fitted wide bore drip tip and a 510 drip tip adapter for a fully customizable experience.The gold-plated 510 connector can be switched out to a squonk-ready 510 pin to use with any of your preferred Bottom Feed devices. The Drop RDA by DigiFlavor and The Vapor Chronicles displays true versatility and customizability in today’s market.